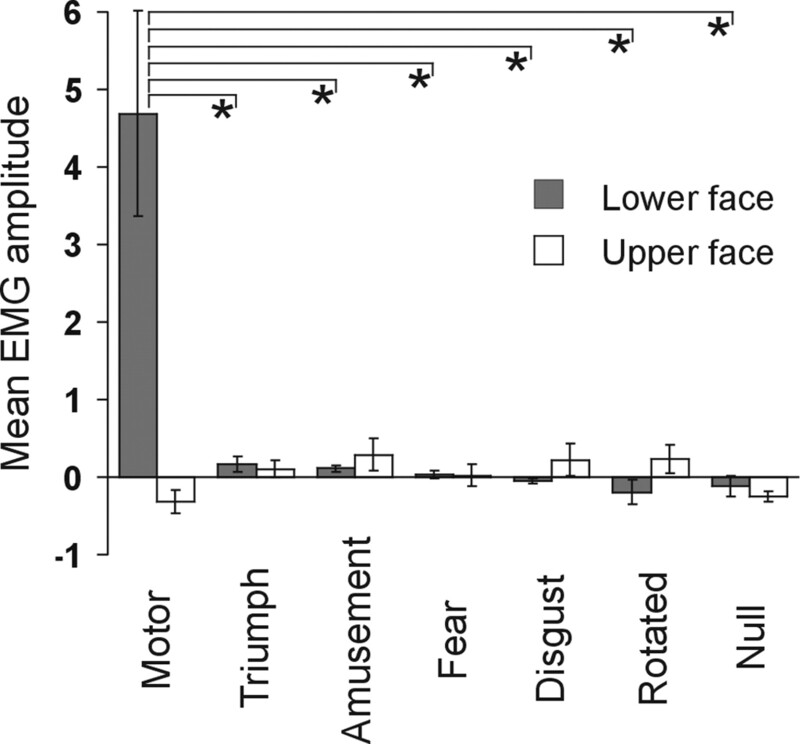 Mean valence and arousal ratings for emotional vocalizations and spectrally rotated stimuli used in the fMRI and EMG experiments. Arousal scales range from 0 (no arousal) to 6 (maximum arousal); valence scales ranged between +3 (maximum positive valence) and −3 (maximum negative valence). Error bars indicate ±SEM. 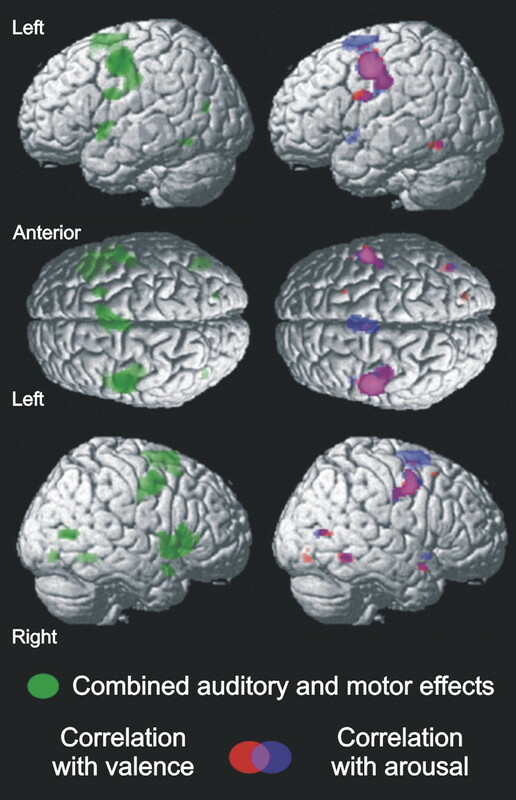 Brain regions demonstrating auditory–motor mirror responses. A shows regions (red) displaying a significant modulatory effect of emotion category on perceptual activation (F contrast, one-way repeated-measures ANOVA). B shows regions (light green) displaying significant activation during voluntary facial movements (motor > baseline). 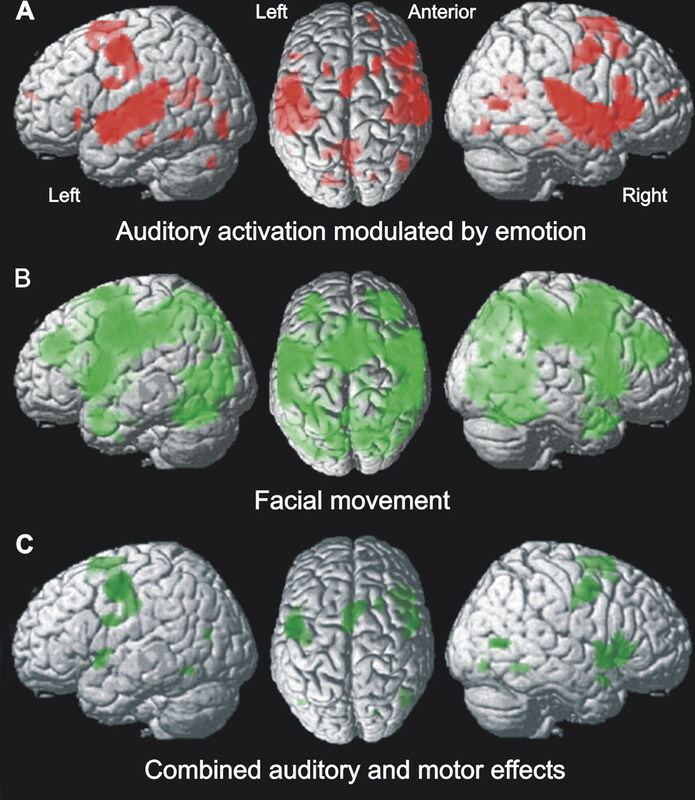 C, A masked inclusively in B shows regions (dark green) displaying both a significant modulatory effect of emotion category on perceptual activation and significant activation during voluntary facial movements. Voxel-level statistical thresholds for the main and masking contrasts were set at p < 0.05, FDR-corrected, with a 10-voxel cluster extent threshold. Statistical parametric maps are displayed on left lateral, superior, and right lateral projections of a canonical brain surface in standard MNI stereotactic space, with color intensity indicating distance from the cortical surface. Auditory and motor responses within premotor regions showing demonstrating auditory–motor mirror responses. The top right shows left lateral premotor, right lateral premotor, left posterior IFG, and pre-SMA activation clusters from the masked ANOVA F contrast presented in the bottom section of Figure 2, displayed on a coronal section from a canonical averaged brain image in MNI stereotactic space. Statistical thresholds are the same as in Figure 2. 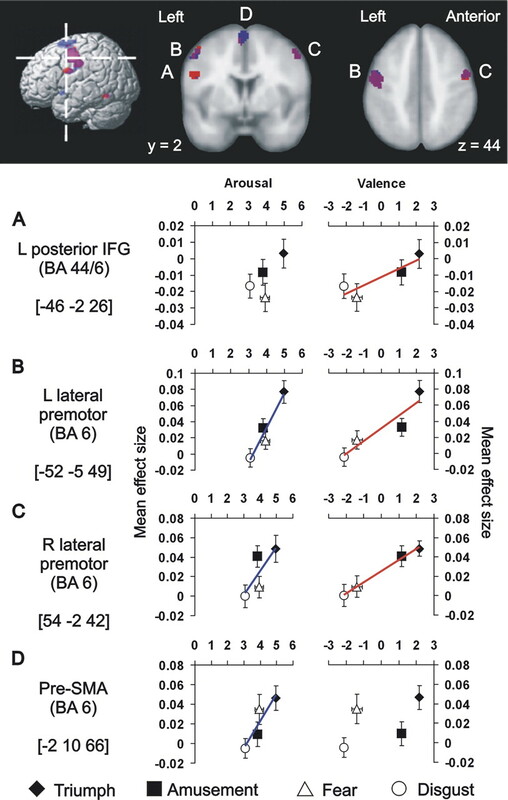 A–D demonstrate hemodynamic responses (mean effect sizes, arbitrary units) for each category of emotional vocalization in the four premotor activation clusters. For the purposes of graphical data display, hemodynamic responses for each category of emotional vocalization (mean effect sizes) were extracted in each subject from 10 mm spherical regions of interest centered on the most significant activation peaks in each cluster using the MarsBaR software toolbox within SPM2 (Brett et al., 2002) and then averaged across the group. 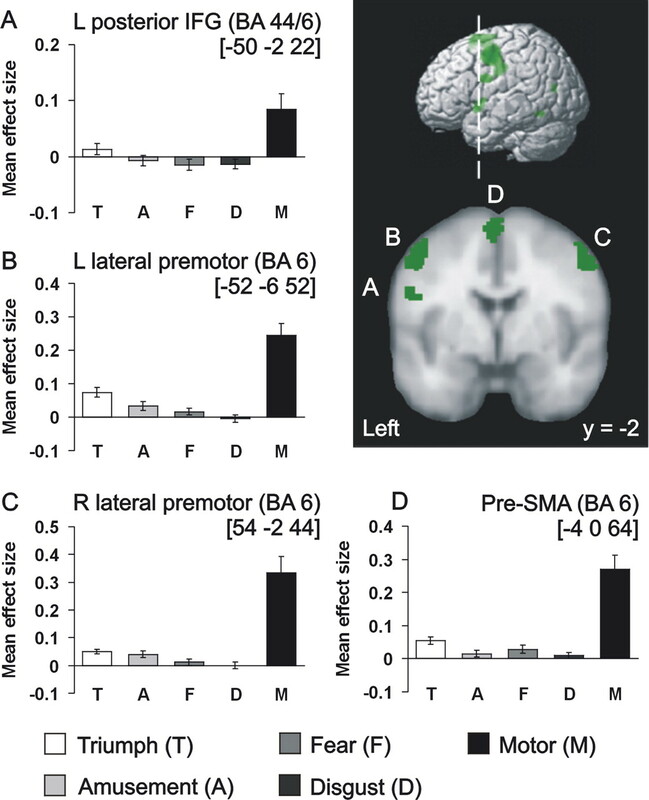 Brodmann area (BA) locations of each peak are shown in brackets. Coordinates (in millimeters) give the location of the peaks in MNI space. Error bars indicate ±SEM. L, Left; R, right. Correlations with emotional valence and arousal in brain regions demonstrating auditory–motor mirror responses. Left, Regions (green) displaying both a significant modulatory effect of emotion category on perceptual activation and significant activation during voluntary facial movements (F contrast, one-way repeated-measures ANOVA, masked inclusively with the contrast of the facial movement condition over baseline), as shown in Figure 2. Statistical thresholds are the same as in Figure 2. Right, Regions demonstrating a significant positive correlation between hemodynamic responses and emotional valence (red), emotional arousal (blue), or both (purple). Statistical thresholds for these contrasts were set at a voxel-level threshold of p < 0.05, FDR-corrected across a search volume defined as the suprathreshold voxels from the inclusively-masked ANOVA F contrast (top row images, green). For display purposes, statistical parametric maps of these correlations have been masked to display significant voxels within the search volume only. Statistical parametric maps are displayed on left lateral, superior, and right lateral projections of a canonical brain surface in standard MNI stereotactic space, with color intensity indicating distance from the cortical surface. Auditory–perceptual responses to emotional vocalizations within premotor cortex correlate positively with emotional valence and arousal. The top shows left posterior IFG and pre-SMA (coronal section) and left and right lateral premotor (axial section) clusters from the statistical parametric maps presented in the bottom row of Figure 4, displayed on coronal and axial slices from a canonical averaged brain image in MNI stereotactic space. Statistical thresholds are the same as in Figure 4. A–D demonstrate the relationship between hemodynamic responses (mean effect sizes, arbitrary units) in each of these premotor regions (for details, see Fig. 3 legend) and measures of mean emotional valence and arousal for triumph (black diamonds), amusement (black squares), fear (white triangles), and disgust (white circles) vocal stimuli. Significant correlations between hemodynamic responses and arousal ratings are indicated by blue lines of best fit; significant correlations between hemodynamic responses and valence ratings are indicated by red lines of best fit. No lines of best fit are shown for nonsignificant correlations. Brodmann area (BA) locations of each peak are shown in brackets. Coordinates (in millimeters) give the location of the peaks in MNI space. Arousal and valence scales are the same as in Figure 1. Error bars indicate ±SEM. L, Left; R, right. EMG responses during listening to emotional vocalizations. Mean EMG amplitude values (microvolt units) were measured as the average change in the root mean square of recorded responses in the 1000–1499 ms time window poststimulus onset compared with prestimulus activity. EMG responses were measured over right-sided lower (zygomaticus major) and upper (corrugator supercilii) facial muscles are displayed for the four categories of emotional vocalization, the rotated baseline stimuli, the voluntary facial movement condition, and the mull (resting) condition. Asterisks indicate the significance values associated with paired t test comparisons between the motor condition and each of the other experimental conditions (*p < 0.03). Error bars indicate ±SEM.